The party atmosphere started at the front porch with this adorable banner made by the TheMistressT of BubbleOffPlumb Inc., oh and the sound of VERY excited dogs barking because their guests had arrived. The great thing about a dog party is, you don't have to decorate much. The dogs would just destroy all your hard work anyway. 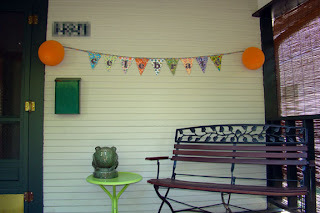 Of course you want to decorate a little, the crepe paper and balloons always says "PARTY!!!" The tables were accented with the parties colors and gingham theme. The birthday dog enjoying her party. Hot dogs were served for the people in keeping with the doggie theme :) along with potato salad and a watermelon salad. A kiddie pool is a great idea for a dog's party on a hot summer day. Birthday girl Betty makes a wish with a cupcake made just for her. A carrot for the candle, so cute. All the dogs got to have beef-jerky mini pupcakes which they devored and begged for more. Apple Brown Betty cupcakes for the people. Delish. 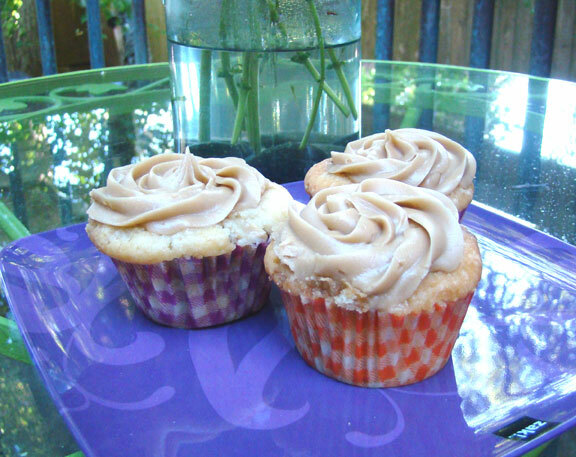 Apples inside the cupcakes and brown sugar icing. 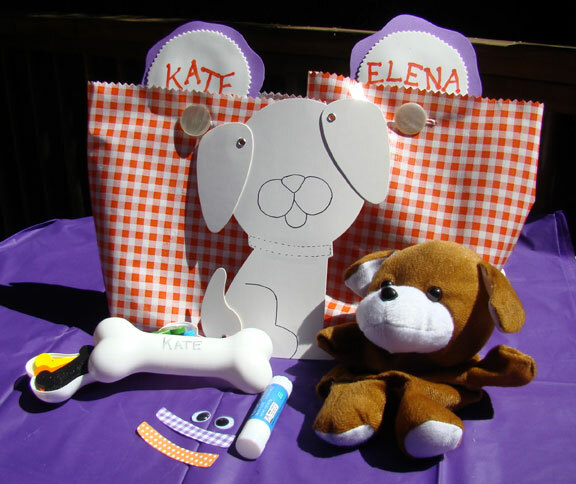 Gift bags for the kids included a puppet, make-your-own dog from JoAnn's dollar bins, crayons and google eyes to decorate the dogs. 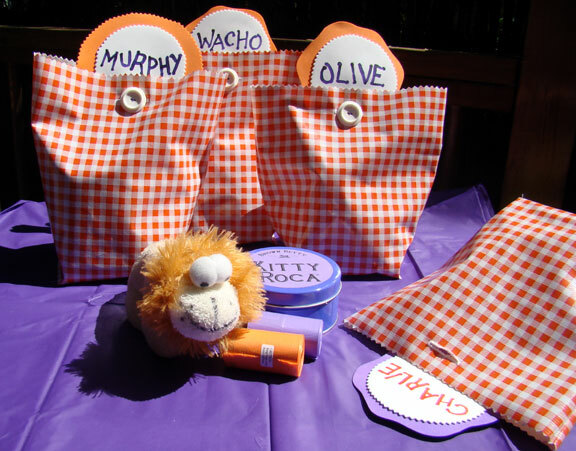 TheMistressT made the gift bags out of oil cloth. 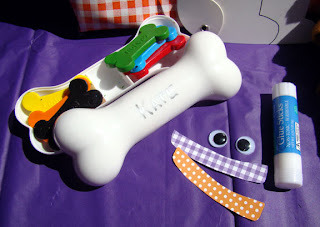 The bone case holding the bone shaped crayons is soo cute! The kids loved it. Of course the dogs got their own party favors too. Bags made by TheMistressT, Dollar store chew toy, homemade Kitty Roca and a Collar Cozie. Betty's guest sporting his collar cozie party favor. 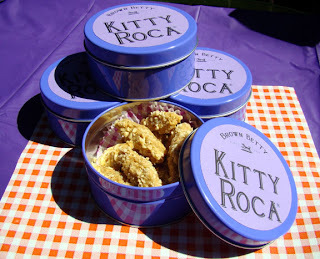 Loved the Kitty Roca favors. The dogs loved them too and it looks like their favorite "treat" ha ha. Made with ingredients people could even eat. Although I'm told dogs find them tastier. Betty didn't need any gifts and the invitation asked that you bring pet supplies that would be donated to the shelter where Betty was adopted from. I found a bag with one of Betty's party colors and filled it with much needed supplies. What a great dog party. I hope that it inspires you to have a party for your dog. If you do, send me the photo's and I'll share it on Fizzy Party! 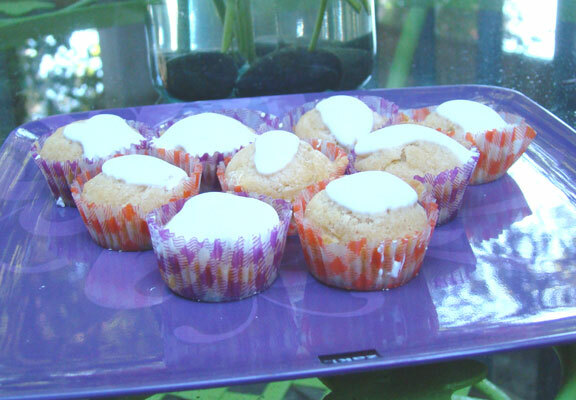 For more detailed information on the party from the hostess TheMistressT, wag on over to here. Thanks so much for your help and encouragement, TikiTiffany! Betty and her dog guests had a great (i.e. wet, dirty, crazy) time and it was nice to chat with all her people guests! It was so generous of you to start off the donation frenzy with your bag chock full of items so needed at "Betty's" shelter! We've a few more pledged gifts to collect, then I'll be taking them in! Thanks also for linking to my little etsy shop! You're welcome, great party TheMistressT. Thank you for including me in your process. You did a dog gone good job and the party favors were great. That's wonderful to hear that you have more pledged gifts. The shelter will love the donations and hopefully you've sparked others to host dog parties and ask for donations for a local shelter. I've always wanted to throw a puppy party. You've motivated me to do one for Kurby in January. This one is soooo cute!